Description: A very popular winter climbing area that often gets quite crowded. While most think of this as a destination for ice climbs such as Cinema Gully and Great Madness, there is some nice rock climbing as well. Across the Universe is a delightful climb and the views down the Notch, especially in the fall, are truly spectacular. As it is south-facing it can get quite hot in the summer! The upper tier rock climbs are usually accessed by rappelling from the summit climber's right of the scenic overlook, but you could also get there by doing Across The Universe. It is a bit of a thrash up through the trees to the base of the upper tier rock climbs. 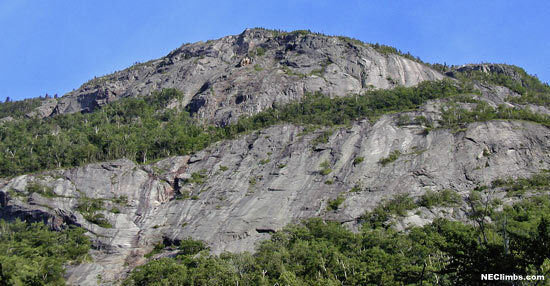 Directions: Located in the top of Crawford Notch on the west side of Rt. 302. Park in the pullout at the top of the Notch and walk back down the railroad tracks to the base of the climbs.